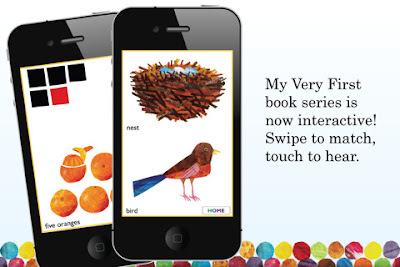 Who better to take kidlings through their first app experience than the superlative Eric Carle? This gorgeous app for iPhone and iPad may be simple but it's beautifully-designed and enchanting for kids. In Colours, kids have three game options - easy, medium and hard. Swiping the images left or right, kids can match the object to the colour. Medium and hard are matching games. 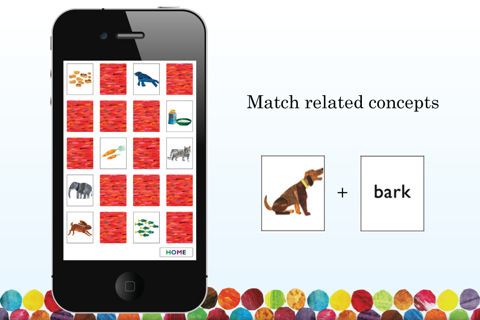 In Animal Homes, kids match the animal to their environment with similar games. Carle's illustrations, simple sound effects and voice overs make for a pleasant app that's educational and fun but not overwhelming, and certainly lives up to its name. High quality production makes it yet another Night and Day Studios winner. Great for comprehension and learning but also for hand/eye coordination, my only criticism is a lack of 'go back' buttons, to move from game to game . . . one must always return to the home menu. There is also the option to add updates to the app, which comes with colours and animal homes, Numbers, shapes, animal sounds and food can be downloaded from your device.